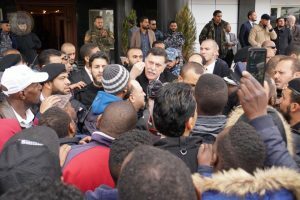 Presidency Council head Faiez Serraj and two of his deputies, Ahmed Maetig and Ahmed Hamza, have told Tawerghan protestors that they are working to ensure that the people of Tawergha can return to their hometown as soon as possible and that they would be compensated for their losses and suffering, as would be the Misratans. There were, however, some obstacles to overcome, they said, and asked the protestors to be a little more patient. They also told them that they had been discussing improving their present conditions with the interior and defence ministries. The impromptu face-to-face discussions took place the forecourt of the prime ministry after dozens of Tawerghan protestors managed to climb over the gates of the building. They have been protesting for a number of days outside over their continued exile since 2011. The cold weather and flooding in the camps where they are housed has made life even more unbearable and has exacerbated their anger. An agreement between Misrata and Tawergha that would see the latter return home and both compensated is being blocked by Misratan hardliners until funds are paid. Yesterday, the National Commission for Human Rights said it held the PC and its Government of National Accord responsible for the suffering and tragedy of the people of Tawergha.